Maybe you have a project in mind? Make windows for your home, glass sculpture for your garden, glass art for your walls? Or perhaps the idea of learning a thousand-year-old craft appeals? 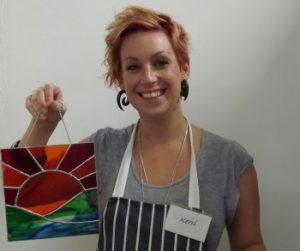 Well – read on – we run all sorts of stained glass classes (and more) for all levels from beginners up, and have a programme of project days to enable you to create your own projects without having to buy tools and find a suitable space to work! Below is a summary of the stained glass classes we run; if you’re looking for something more specialised get in touch. Suitable for – all levels including beginners, those who’ve tried leading, those who want to learn to cut glass accurately. This class can be held on a weekday if required. What you will learn – glass cutting, using the grinder to achieve accurate fit, the ‘Tiffany’ method of SG, a little about the history of this method, bead soldering, some design basics. This method is suitable for – highly decorative pieces, 3d designs (like lamps and boxes), indoor display, large pieces where supported by a board or frame. The copper foil method of stained glass emerged in the Tiffany Studios of New York in the 1880s, and is sometimes called the ‘Tiffany Method’ even now. Foiling is particularly suitable for domestic art as designs with many small sections of glass can be made without the constraints of the properties of the lead used in the traditional leading method. On our copper foil class you’ll make a window hanging piece roughly A4 in size, plus a mini project in the morning to practice the key skills. We provide a choice of 5 designs to make, ranging from a Victorian style panel to a Mondrian-inspired design, with art-deco, sunrise and Mackintosh-Rose designs too. Suitable for all levels inc beginners, those who’ve tried foiling, those who want to learn how to make weatherproof panels – eg windows, doors, garden sculptures. This class can be held on a weekday if required. 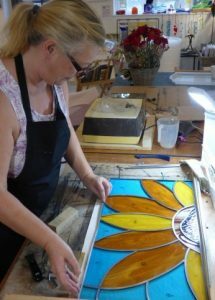 What you will learn – glass cutting, using the grinder to achieve accurate fit, the traditional method of assembling a panel using lead cames, joint soldering, some of the history of traditional stained glass, some design basics. This method is suitable for – larger panels, window or door panels that need to be weatherproof, designs that benefit from clean join lines of consistent width, where a traditional appearance is desired. Using lead to join together pieces of glass to form a weatherproof window is a construction method that can be traced back to around 750AD in the UK. On our leading class you’ll make a garden panel – a piece of glass art you can display in your garden (or indoors). As with the foiling class, you’ll make a mini project in the morning; you’ll then have the rest of the day to make your main project. 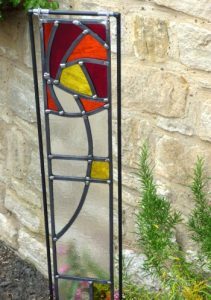 We provide 5 starter designs to choose from, and a range of coloured glass. No two students’ projects are alike! If your goal is to learn how to make a window for your home, this is the ideal starting point. The leading method is still used to make windows today, and is also the preferred choice for larger pieces where the strength limitations of foiling would be a problem. When making a window, there are considerations concerning panel fit, strength and weatherproofing that are key to a successful and long-lasting installation; we suggest getting some further experience in leading before committing to a window. Of course we’ll be happy to help with this; in fact, this is what our Leading Level 2 class is intended to support – see below. Suitable for all levels inc beginners, those who’ve tried foiling and want to develop their skills, those who want to make art with a function. This class can be held on a weekday if required. This class (although also suitable for beginners) goes beyond basic foiling and introduces a number of new techniques. The outcome is a practical mirror that can be displayed and used! The structure of this class includes additional steps specific to mirrors, and covers the use of patina too. There’s more to learn for students who’ve already tried foiling so we recommend this class as a fun and interesting level two class for those keen to develop their foiling skills beyond the basics. Suitable for- Suitable for all levels inc beginners, those who’ve tried foiling and want to learn how to make 3d objects, those who want to make art with a function. What you will learn – glass cutting, using the grinder to achieve accurate fit, the ‘Tiffany’ method of SG, how to assemble and solder 3d objects using jigs, using patina to enhance your lamp, fitting lamp hardware in to a finished lamp. This method is suitable for – column lamps (as made on this workshop), ‘Tiffany-style’ lampshades, fan-style lamp shades, tea-light and candle-holders, terraria and decorative glass boxes. This class develops on the foiling basics covered on our 1-day beginner’s class with more challenging designs, and the added learning opportunities associated with building a 3d object in glass. Students who’ve done some foiling will benefit from the greater emphasis on cutting accuracy and an introduction to the methods used to solder glass sections in to 3d objects. 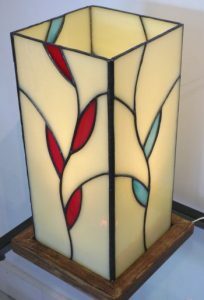 The outcome of the weekend will be a stylish stained glass column lamp – a style that’s very much in vogue these days, and one that suits most interior decoration styles! Suitable for – those who made some copper foil or leaded projects and want to learn how to add etched details. What you will learn – using etch resist and scalpel to prepare glass for etching, handling, preparing and using etching cream. This method is suitable for – etched glass can be incorporated in to foiled or leaded projects, and is suitable for outdoor use in leaded projects. Perhaps you’ve seen glass with an attractive frosted design? Or maybe you’d like to add delicate details (especially numbers and letters) to your glass-work? Etching is a studio-friendly way to achieve this look without the need for a sandblasting set-up with chamber and air compressor. The chemicals needed are safe to handle if used as specified, and suitable for home experimentation. This class requires some experience of stained glass work, as the majority of the class time is spent on designing the etched components. As etching is equally suitable for leaded and copper foil projects this added technique will appeal to all glass experimenters – and it can also be used on fused glass (after fusing). Suitable for – those who’ve attended beginners classes in leading or foiling and want to create their own designs; beginners are recommended to attend at least one beginner’s class before joining this session. 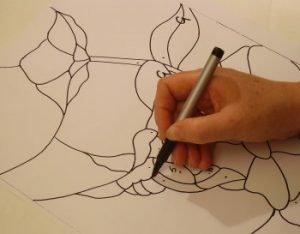 What you will learn – the design rules for working with glass, how to translate a sketch or photograph in to a workable stained glass design, cutting difficult shapes in glass. 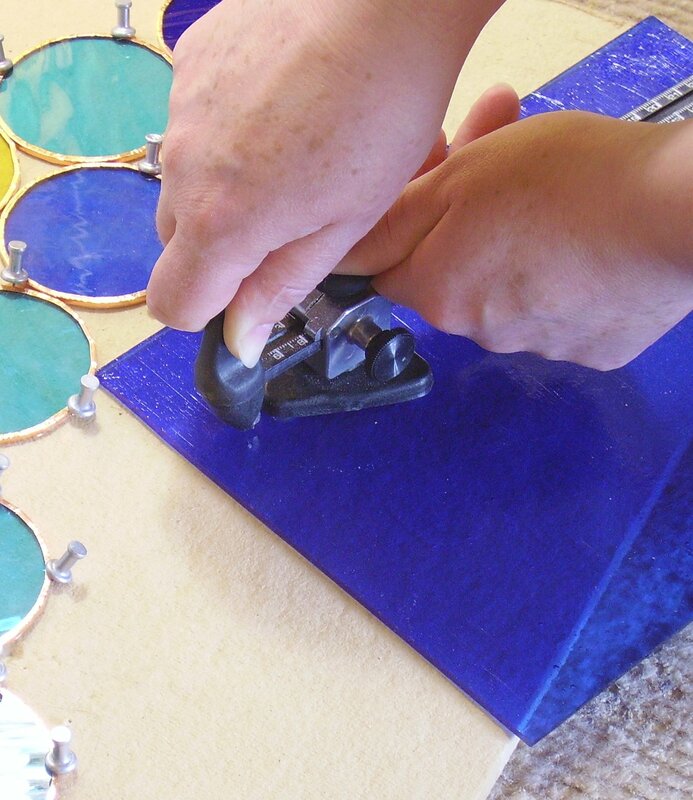 This method is suitable for – your new design skills can be applied to all sorts of stained glass projects, including both foiling and leading. This class requires some experience of stained glass work, as the majority of the class time is spent understanding design principles and the constraints working with glass brings. 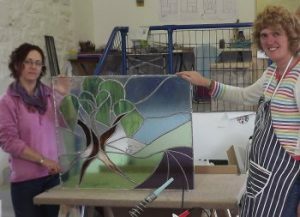 If you’d like to use what you’ve learnt on this class and make a stained glass panel of your own design, our Project Days programme may be the best way to develop your skills further. Suitable for – those who’ve done leaded stained glass before or who have attended our beginner’s leading class (aka garden panels). Beginners are recommended to attend our 1-day beginner’s class before joining this session. What you will learn – cutting glass more accurately than is expected on a beginner’s class, cutting and shaping leads to higher standards of precision, cutting and leading to pre-set dimensions. This method is suitable for – – larger panels, window or door panels that need to be weatherproof, designs that benefit from clean join lines of consistent width, where a traditional appearance is desired. This class is all about developing existing leading and glass cutting skills. If you’d like to make your own windows, this class is especially valuable as the structure revolves around building your panel according to the design. On our beginner’s class we don’t expect your panel to exactly match the design; on this class you’ll build up your panel on top of the design, in the same way you would if you were making a size-critical panel. This class is intended to give you the confidence to tackle your own projects, and to work independently towards a finished panel of your own design. Beyond this level 2 class, you can use our Project Days Programme to work on your own stained glass pieces, or join one of our 5-day courses. Suitable for – those who’ve done some stained glass work before, in the method to be used for the project. Beginners with a project in mind are advised to discuss their plans with us to identify the best way to proceed. These project days are intended to help you achieve your project plans in a supportive environment, using our tools and facilities. What you make is up to you – but we recommend sharing your plans so we can help you get the best use of your time and materials. You’re welcome to bring your own materials or you can use ours, charged at cost at the end of your project. Project days are bookable in advance and usually take place on weekdays although weekend sessions are possible if there are no formal classes taking place on your chosen days. You can pay for your sessions at the end of the day(s) when we’ll work out the cost of any materials you’ve used too. Project sessions are ideal for those who are confident in working independently; of course we’d never allow you to struggle and are always on hand for a reminder or gentle encouragement! Recent projects have included – glass garden sculptures, large windows, garden panels, wall art, fused glass art, slumped glass dishes and more. What would you like to make? For glass fusers, the cost of each project day includes one firing in the kiln. Additional firings are charged at a nominal cost. Because of the need to schedule kiln use we invite you to plan your fusing project some time in advance! 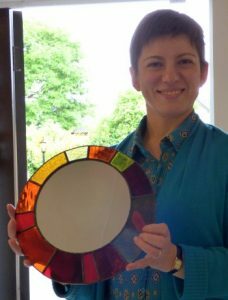 Suitable for – absolute beginners, those who’ve done some (or a lot of) glass work before, anyone with a stained glass project to make who needs a fully tutored course. The structure of these 5-day courses is tailored entirely to the needs of the students. If you’d like to start at the beginning and follow a class plan, that’s fine. If you’ve done some glass work before and you’d like to develop your skills through a series of planned exercises, that’s also fine. Or if you’d like to work on your own project (or more than one project) that’s equally possible. The course in Cornwall is like an art holiday – Porthleven is a great place to stay and an ideal location for our course – the Lifeboat Studio is an atmospheric venue with plenty of space and light. The harbour village has a range of pubs and restaurants and a choice of accommodation to suit most budgets. 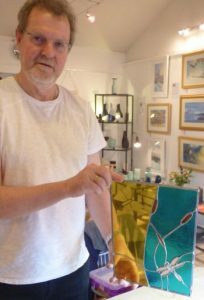 Past attendees on our Porthleven courses have made windows, garden sculptures, all sorts of lamps and lampshades, decorative art, 3d glass objects, large wall art and much more. We’ll discuss your plans with you in advance to make sure they’re achievable (and transportable!) and all attendees are eligible for our ongoing support and advice so the course really is a launchpad for the prospective stained glass artist! 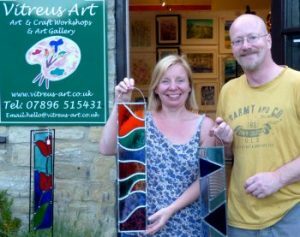 Our 5-day course in Northampton follows a similar concept, with the addition of the option to try glass fusing with the kiln in our studio. The group size is smaller but we still aim to have fun as well as creative! Both 5-day courses (and all our 1-day classes) have their own website pages; if you have any questions get in touch! Thanks for reading – feel free to get in touch, or learn more about each cvlass on its dedicated website page. What does it cost to get set up in stained glass? We get this question often – at craft fairs, exhibitions and gallery demo days: I fancy having a go – what will it cost me? The flippant answer is – your soul! It’s an engrossing hobby, can become an all-consuming lifestyle, and some even do it for a living! But sliding back into reality for a moment, it’s not cheap to get started, which is why a day’s course or spending time with an established glass artist is a good idea: it’s not like buying a pad and some paints! So, come on Mike, what’s involved? A glass cutter – not the £3 job you can buy from a DIY store, a proper oil-filled tungsten-wheeled one. Our preference – Toyo Supercutter, costs about £25. A good pair of grozing pliers, for nibbling, and a pair of cut runners, or glass snappers. Together these are about £15. We use Glastar snappers. Next, you’ll need a grinder. We have several Glastar grinders, large and small, for teaching, and the lowest-priced one we’ve found that lasts is the Superstar, at £150 now that VAT has gone up. You’ll also need decent soldering iron. There seem to be two that are worth considering, both by Weller, the giant of soldering technology! The 80W ‘starter’ iron is ok for occasional use and costs about £50 with a stand to keep it safe when working. The 100W ‘pro’ tool is about £90. So those are the main tools you’ll need. But you’ll also need a work surface, a straight edge, layout strips and pins to hold your design together when soldering, and pens, paper, something to keep your glass in, and a good working light. All this lot could cost you £50 if bought in one go. Oh, and let’s not forget – the consumables! Foil is now about £10 a roll, and you’ll need at least a couple of rolls to begin with, and solder is now about £10 for half-a-kilo, which is enough to get started with. And flux and grinding lubricant for your grinder, and cutting oil (or white spirit) will add about £10 on top. This is a tricky one. We start our students off on clear ‘horticultural’ glass initially while they learn to score and break glass consistently. This is cheap, but once you’re confident enough to make something with ‘proper’ coloured glass, you’ll find that sheets about 12″ by 12″ cost from £5 up. The fancier glass costs more, but we always recommend newcomers start with Spectrum glass as it’s affordable and easy to cut. And looks great! For any sort of interesting design, you’ll need several different sheets, and the off-cuts may not be very usable shapes or sizes. As a guide, we reckon on about £30 for glass and consumables each for our students on our Vitreus Art one-day class. If you’re looking at leading, a collection of tools to add to the basics above can be bought for about £25, plus the lead itself. Check back next time for info on some other tools that are fun to use, like the circle cutter in the picture above. In the meantime, do leave a comment and let me know which tools you’d recommend to a novice, or which you found hardest to use! Or email me via this blog.